So If you have seen my blog in the past then you might have seen that I started my own design company thing and I started selling on etsy. I started doing custom designs for free at the beginning when I was still learning and now that I have mastered it, I am now selling Templates. It was difficult at first to figure out how to sell templates on Etsy, how to get them to work properly, have the right codes, and just make them cute, elegant and just have good ideas and be creative with them. I have taken so many breaks from designing and seem to find myself coming back to it. I love it and I can sit on my computer all day perfecting them and making multiple templates at once. It is so fun to be able to be creative online and being able to share that with people, but at the same time it is a lot of hard work. Having time is the most important thing and I just haven't made time for designing properly, but like I said I always seem to come back to it. Well, I am really going to focus more on designing and making some pretty great templates. I plan on doing a lot of different things and finding ways to improve my designing when it comes to HTML codes and Photoshop/Illustrator. I want my blog to be diverse in content and I think this is going to be one great thing to share with you all. With doing template giveaways and just being more interactive with you, the audience and we all like giveaways right? When I started everything I designed was purely image based. So every little thing on the blog was images and the blogger couldn't really do much with it. Now everything is code-based. Everything is either found on the EDIT HTML section of the template or widget codes added to the layout. The colors, fonts, widths, heights, ect. can be altered with the proper knowledge of where these codes can be found ( and its really not that difficult ). I have gotten more familiar with Photoshop and Illustrator and have been able to improve my designs by a lot! Also, I have found great codes and gadgets to add to a blog to make them a bit more unique. From hover image effects to custom search buttons. It has taken a great deal of time to learn all of this, but when you are really interested in something you will do anything to learn and get better at it. A lot, A lot of research, studying codes and even more trial and error. It really tests your patience especially when codes don't work properly or things just don't look right. I have spent hours and hours finding the best codes and watching videos to help me get to where I am. There are a lot of people out there who are willing to help starting designers get better and if it wasn't for them, I don't think I would have kept going with designing. Also, I have a lot of Editing blogs where I test new codes, designs and fonts to be able to master it all down. 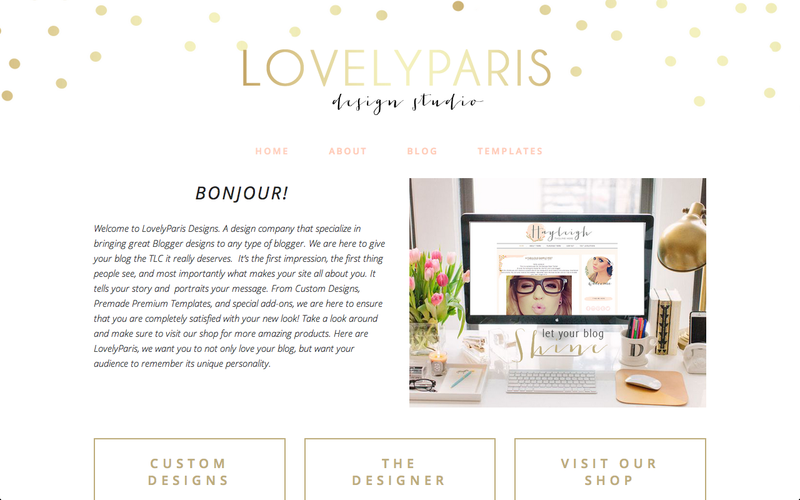 So when I finally felt like I was ready ( which is now), I decided to re launch a whole new and improved LovelyParis Designs. This time, for real. I started to slack when it came to finishing designs and customer service, but now I have my feet on the ground and willing to do what ever it takes to insure 100% satisfaction with my designs. 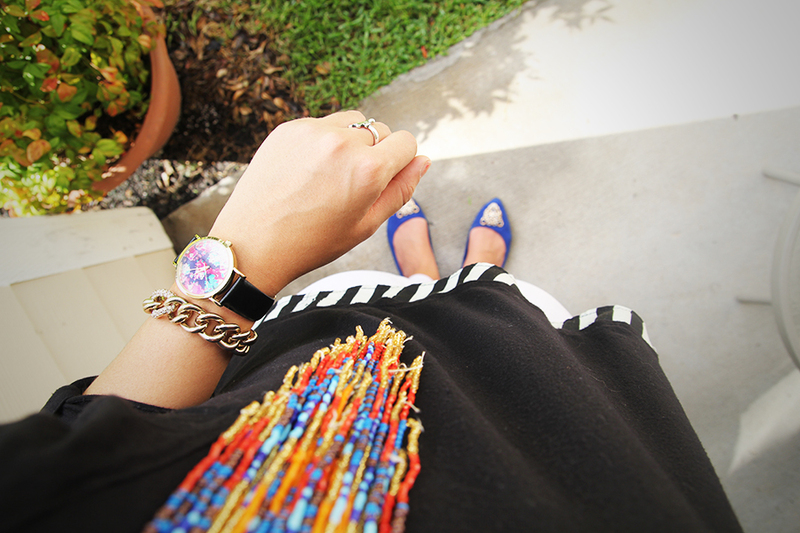 Where Can You Find LovelyParis Designs? I will be launching a website within the next few days where you can contact me, see previous designs along with some new once, find out how to purchase add- ons such as "Welcome" images, custom search bars, custom headers, social media buttons (with/without hover effect), and more! You can also find my templates on Etsy.com. Just search "LovelyParis Designs" and you should be able to find me. Don't hesitate to ask any questions about blog designs or anything pertaining to designs. Just shoot me an email, I am happy to help. 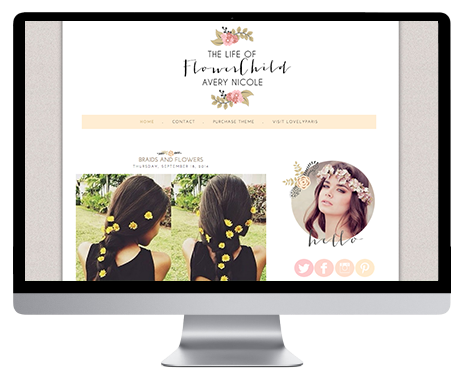 I can not wait to share with you all my designs and codes to improve your blogs! Thanks for stopping by and I will see you all next time!! I know I haven't posted in a while but with my busy school and work schedule and my laziness it has become sort of difficult to find the time to just sit down and write or do stuff for my blog. But how do you keep going? I know that there are things that you must do with your life, but what if this is the thing that makes you the happiest? So I have figured it out ( for myself that is). We all have different schedules and a lot of you do this, but I just never have a set schedule. But enough is enough. If this is what makes you happy, like it does to me, then you will do anything to do it. So here is what I have set out for myself to do ( I haven't started but I'm going to TOMORROW). If you have a hard time sitting down and blogging or doing what you love, then try this with me. We all say we don't have the time, but lets make the time! Set a date and a time of day that you know that you will not be busy and just do it. Its hard sometimes to just think "Uh, I don't want to, Im tired!" and that is what I do all the time, but I will no longer do that. I know that when it comes to my content, I tend to overthink them. I am not sure if its a good idea or not and I end up not doing it, or I have a great Idea but not the energy or resources to make it so. NO MORE! To have a great blog/channel you have to put your heart and soul into making it what you want it to be and your effort will be reflected in your content. Make it your fun, have fun. Remember your blog and your post are YOURS. If you have fun making it or find it interesting, then do it. Don;t worry on what others think or comment because if you think about it , they go through the trouble of going to your blog/channel, reading your post or seeing your videos and then going through the effort of leaving hate, and you just had fun making your content! So no matter the idea, just have fun with it. If this is what you love to do, then there is nothing that should stop you! Now that I have said all that! 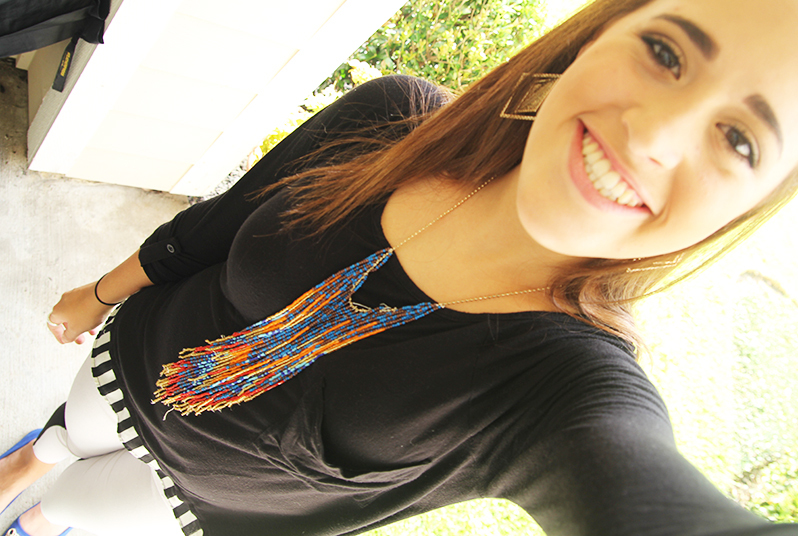 Here is one of my favorite outfits. 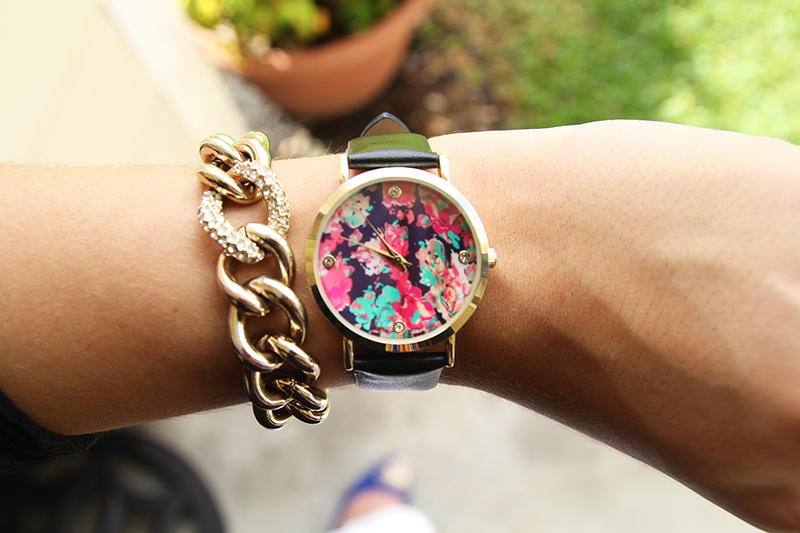 The watch goes with everything and the flowers just make it so cute and gives my outfit just a little sparkle. Then my shoes. These shoes are my favorite pair of shoes. I love how comfortable they are and how BRIGHT they are too! The tiger just gives the shoe a little attitude which we all need in our life from time to time! I hope that you all enjoyed this post, and NO MORE SLACKING for me! I hope you all have an amazing week and I will see you guys next time!! Make sure to check out my Youtube Channel at the top and My weekly favorites! !